Hypersonic speeds are greater than five times the speed of sound. An aircraft flying that fast could theoretically reach London from New York in less than an hour. Virgin Galactic's space flights will accustom passengers to flying at the extreme altitudes likely necessary for hypersonic travel, said Alex Tai, the venture's chief operating officer. "The experiential rides that we're providing with Virgin Galactic are the first rung, or the stepping stone, for us to use space for other activities," Tai said. "And the first one of those we'd like to look at is point-to-point travel on the planet," he continued. The venture will explore the possibility of hypersonic travel as part of a memorandum of understanding it signed last month with the U.S. space agency NASA. "If Virgin's going to go off and build a high-speed transoceanic passenger service craft of some sort, NASA's of course very interested," said Dan Coughlin, NASA's lead for the Virgin Galactic agreement at the Ames Research Center in Moffett Field, California. In 2004 NASA twice flew a demonstration vehicle successfully at hypersonic speeds. Since the demonstration flights, NASA researchers have continued to hone their engineering tools, but budget cuts and other priorities have put plans to build a hypersonic space plane on the back burner. Nevertheless, "NASA has unique capability and unique engineering skills and facilities that we've developed over 40 or 50 years that could benefit Virgin," Coughlin said. According to Tai, Virgin Galactic sees that benefit. The collaboration with NASA will allow the venture to tap the agency's engineering prowess to assess the feasibility of a hypersonic passenger service. "We can't do it ourselves, so we've gone to the experts in the world, which are NASA," Tai said. Virgin Galactic plans to take customers into space aboard SpaceShipTwo beginning in 2009. The round-trip flights will take off from Mojave. Tickets cost U.S. $200,000. The two-and-a-half-hour trip, according to Tai, will accustom civilians to space travel much in the same way pilots returning from World War I accustomed civilians to air travel. World War I pilots went from town to town taking people up for joy rides in their planes as a way to kick-start the airline industry, he said. Virgin Galactic's spaceflights will also give passengers "an appreciation for the fragility of the Earth and a fantastic view," Tai noted. "But the long-term goal—going from A to B—is probably where the larger market is," he added. I can't wait to book a seat on that flight! Just imagine the photo opportunities! 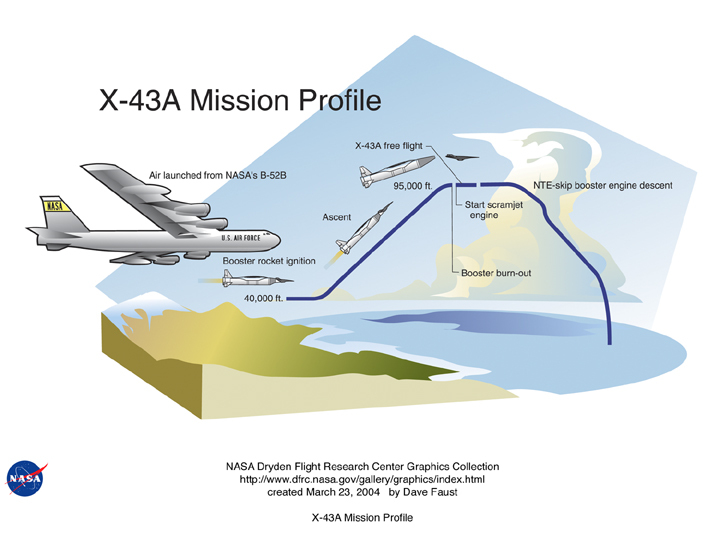 For more information on this awesome technology, check out A Closer Look at the X-43 Mission and X-43a Raises the Bar to Mach 9.6. Of course, there are always military implications when dealing with technology such as this, check out my blog entry: Hypersonic Cruise Missile.